Late February, early March. Winter is at its peak. Nights are very cold and the days are not any better. Our beautiful, northern landscapes are being enriched with clear, white snow, which falls in great abundance. The animals which are not asleep are suffering harshly from the lack of food, trying to survive as best as they can. But not all has given up. Even if the conditions are harsh and there is no sunlight to shine upon your skin, to give you its warmth, you feel that it is strengthening. Something is changing in the air. You are overwhelmed with a strong and fresh feeling of willpower. The time spent in the peaceful silence of winter will soon come to an end, and that makes you feel fresh, that makes you feel young, that makes you feel furious, that makes you feel strong. My fellow European, you are experiencing the return of Jarilo! Jarilo, also known as Jaril, Jarun, Jure, Jurij, Jaro and Jarovit, is a very important pan-Slavic deity of vegetation, fertility, and youth. Jarilo is considered by many to be the Slavic variant of the “Father Harvest” deity in Indo-European religion. In Belarus folklore, Jarilo is depicted as a barefooted young man, whose beauty can’t be matched, with a big phallus, dressed in a white tunic and a cape of the same colour. 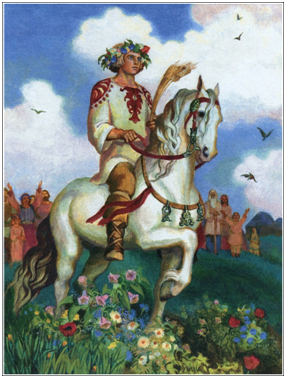 He wears a crown of field flowers and is riding a white or a green horse (depending on the region). His head is enriched with golden curls of hair. In one of his hands, Jarilo is carrying wheat, while in the other one he is carrying a human head, whose blood pours down on the fields. He comes to our world in early spring, bringing warmth with him. Throughout centuries, it has been sung about how the Earth gives birth to grass and plants where Jarilo has walked. Because of this, Croats and Slovenes refer to him with the epithet Zeleni, which means the Green One. Even though this deity has many name variations, they all share the same root, which is jar (pronounced “yar,” not as the English word jar). This root appears in many words that are connected to wheat and young animals, some of which are jaro (wheat sown not long ago), jare (lamb), and jarica (hen, which hasn’t laid eggs yet). The root jar also appears in words that describe fury (jarost), heat (jara), embers (jar / zhar), and lust (jary). In some modern Slavic languages, spring is referred to as jaro (Czech, Slovak). Examining all of these terms, we can see that they are all used to describe something youthful in all its aspects. Popular east Slavic names which are based on this deity are Jaroslav and Jaropolk. Sreten Petrovich noted an abundant list of south Slavic towns and villages with the toponym Jarilo: Jar, Jarevac, Jarinye, Jaruzhani, Jarovice, Jarovlye, Jarovoda, Jarosh, Jaroshevici, Jarun, Jarushke, Jarushye, Jarchevac, Jarchevo, Jarshe, Jarlovica, Jarlovci, Sary Jar, Jaroslavci, Jarlovo and Jarlovsky egerci. Radoslav Katičić, Croatian philologist and pan-Slavist, and Vitomir Belaj, Croatian ethnologist, attempted to reconstruct the mythology surrounding Jarilo in the 20th century. According to these authors, he was a fairly typical life-death-rebirth deity, believed to be (re)born and killed every year. His mythical life cycle followed the yearly life of various wheat plants, from seeding through vegetation to harvest. As a reconstruction, it should generally be taken with a grain of salt, not as something that was, in its full sense, present and believed amongst the people. The path that Jarilo takes is closely related to seasons. In short, the myth talks about Jarilo, the tenth son of Perun, being taken by Veles to the underworld and spending winter there. In spring, as a young man, he travels across the rivers and across the plains, all the way to the groves where he meets Mara, his twin sister, and they fall in love. Later during summer Jarilo cheats on her and she, in a rage, makes her brothers kill Jarilo. After this, in anger and grief, she turns into Mara as we know her: a deity of cold and dark times. They are then reborn and the whole process starts again. Koledari are young men dressed in fur, who carry horned masks. They go from house to house, sing, and ask for a gift in return. Similar songs have been sung in Croatia and in Serbia. This is one of the ritual songs which have been sung for centuries on Jurij’s day in Croatia and Slovenia. The ritual is performed by a number of villagers, one of which, a young man, is furnished in green, leafy branches. He is the representation of Green Jurij. Other villagers go with him and sing the ritual songs. 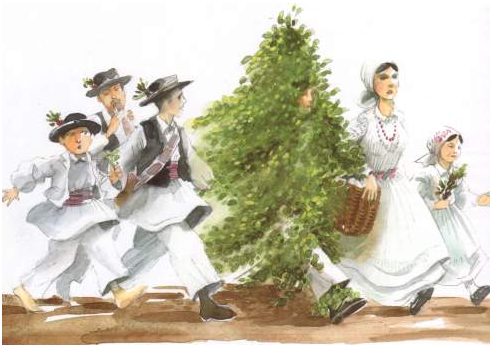 They walk across the village and visit every homestead. People who live there come out and give Jurij a certain offering, for which he blesses their land and makes it fertile for the season. Based on these songs, Radoslav Katičić and Vitomir Belaj recreated the myth of Jarilo. Jarovit can be translated into Furious Lord or Young Lord, but it can also be translated into Furious One or Young One, due to the suffix it (another example being rechit, meaning the one who talks a lot). 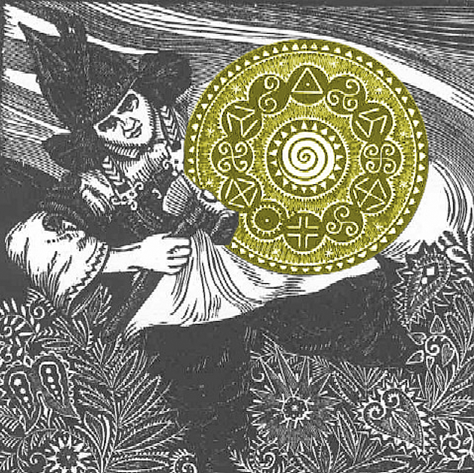 Unlike other names under which this deity appeared, Jarovit didn’t survive through folklore, but on the other hand, Jarovit is the only variation of Jarilo’s name which was recorded in the Middle Ages. Otto of Bamberg, a German bishop that lived in the 12th century, mentioned Jarilo in his chronicle under the name Gerovit and compared him to the Roman God of war, Mars. Shrines dedicated to him were built in the towns of Hobolin (Havelberg) and Wołogoszcz (Wolgast). On the wall of Wołogoszcz temple, there hanged a golden shield, dedicated to Jarovit. It was bigger than regular shields and it was coated in golden tiles. This shield was the most sacred object in this temple and nobody could touch it in time of peace. In time of war, it was taken down and was carried in front of the army, which led to boost of morale. The army of Wołogoszcz believed that they will be victorious because they have the protection of the shield and Jarovit on their side. One day, a German priest took the shield from the temple and because it was the time of peace, and nobody could touch the shield, he managed to escape without resistance. Otto of Bamberg also took notes on what the priests of the temple said. They talked about Jarovit being a fertility God that makes the development of plants and animals possible. St. George was a Roman soldier of Christian faith who had a Hellenic background. He met his end during the prosecution of Christians in the year 303 AD. In 494 AD, Pope Gelasius the First recognised St. George as a saint. His legend talks about a dragon that lived in a lake near the city of Lide. The Dragon often came out of the lake and feasted upon anyone who has gotten too close. It also had a foul, poisonous breath which made people sick and they often died because of it. At some point, townsfolk finally went with their complaints to the city ruler. He told them that in order to get rid of their dragon problem they have to sacrifice a child to the dragon each day. 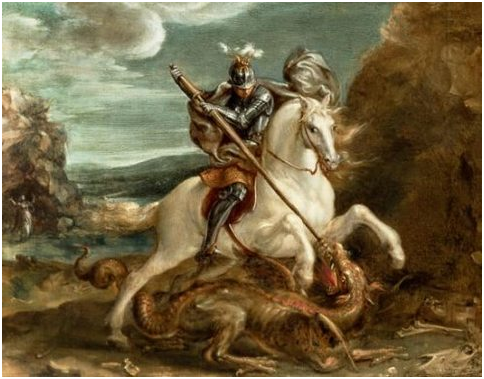 Finally, one day, time came for the lord’s daughter to be sacrificed, and when she came to the lake, St. George appeared in front of her and upon spotting the dragon, took his spear and pierced the dragon’s head. His day was celebrated on the day of his death, on the 23rd of April. Later due to calendar changes, Orthodox Christian Slavs started celebrating him on 6th of May. The connection between Jarilo and St. George is apparent. Like George, Jarovit of the Polabian Slavs was depicted as a spearman. Both Jarilo and George are depicted as young men who ride a horse, both are celebrated in springtime when the land is the most green, and both share very similar names. Worship of St. George is very prominent. We see that Serbs of Vojvodina, who live farming lives, often worship St. George as their family’s patron saint. This is the strongest evidence we have about St. George being connected to the farming cult, just like Jarilo was. Jarilo has been connected to a celebration that usually goes by the same name. The celebration of Jarilo takes place in spring. In Belarus, it was celebrated on 24th of April and in Banat region of Serbia it takes place on 7th of May. On the other hand, in Russia, it was celebrated in early June and unlike in other parts of Slavdom, here Jarilo is depicted as an old man. Folklore content is the same from Slovenia, to Russia. Jarilo is physically represented by a doll. Young people will go out to the fields and dance around, enjoying their time. At one point, they will make a figure of Jarilo with a big phallus out of straw or clay. The doll would be taken to its resting place in the same manner a deceased would be taken. Jarilo was usually carried by women and girls, with loud tears and cries. The men who followed the ritual commented how the women have the right to mourn him, for he was sweeter than honey. They would burn, bury, or drown the doll and then continue the celebration. Dr. Sreten Petrovich, Serbian philosopher and professor of aesthetics, who went through small villages and towns and collected lore, writes in his book Serbian Mythology: Mythology, Magic and Rituals – Researching Svrlyig Region about how people of the Svrlyig region celebrated the day of St. George. It all starts two days prior to George day. Women of the village went out to the fields, where they would gather tall grass. The gathered grass was used to knit wreaths. They would usually go in a group and bring food with them. On their way back, they would pick up sticks with which they made the frame for the wreaths. After they returned home, they put the bags filled with grass somewhere to stay until dawn. In some villages, half the gathered grass was drowned in water. Next to these bags, they put salt, a boiled egg, and a strainer which holds a “kravaj” that was baked that day. 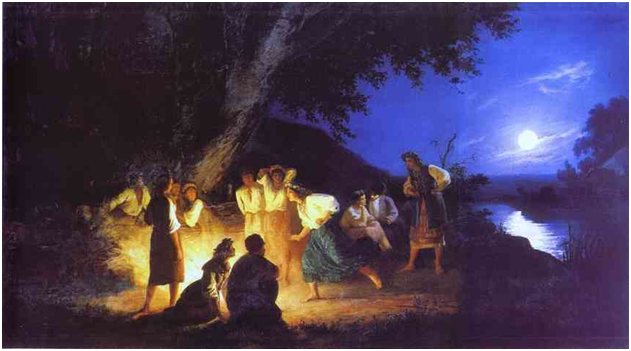 The next day, before dawn, the whole village gathered and they brought musicians with them and together they all, while singing and playing music, went near a body of water (river, spring, etc…) and there they knit wreaths. With them, they would bring the bags filled with grass, some flowers and plants they would add to the wreaths, sticks, and also the kravaj, the egg, and the salt. They also brought food and bottles filled with drinks with them. The bottles would later in the evening be refilled with the water in which the grass has been drowned. During this day women knit the wreaths, young men would sprinkle them with water, and the musicians would play. The atmosphere would be very joyous and lively. During this night, young people rejoiced, for they had been given an opportunity to be more open. Young men would hug and kiss their women, but also the women of other men and young women would be happy about it. Back at the village, in the evening, householders would cut sticks from hazel, wild rose, and oak and with them make some sort of arc. The householder’s wife would in the meantime bake bread. When the arc has been completed, on the other side of him, the householder’s wife would place a kettle, on top of which she would place the bread: usually pierced, with a napkin, a comb, a pierced stone and a ring. The host would dig a small hole under the kettle and, in it, place the kravaj, salt, and egg. Sheep would be gathered and each of them would first have to cross through the arc. After that, they would be brought to the kettle and the host would try to milk them, filling up the kettle. The bread and other items would get soaked in milk in the process. After the first sheep was milked, they would put a wreath on her head, after which all other sheep were milked. The kettle would be brought to the housewife, so that she could make cheese out of the milk. Kravaj, salt and egg would be taken and placed in an anthill. In the morning, on George day, they were taken out and the anthill would then be filled with lamb feces. Then the host would cut up the ears of his lambs, all in a certain way, so that they could be separated from other hosts’ lambs. One lamb would be ritually sacrificed and baked. After the feast, the anthill would be filled with the bones of the sacrificed lamb. From the Baltic coastlands and the edge of Balkans, to the plains and forests of Russia, we can see that, historically, Jarilo was a very important figure to all Slavic people. Some referred to him as Jarovit, the mighty protector and great leader of armies. Others referred to him as Jurij, the leaf covered young man, while some also referred to him as Jarilo, the beautiful young figure who rides a horse. Even if there are some cultural and linguistic differences between these variations, they all represent the same deity of fertility and youth. I highly suggest that you check out this short animation that is based on the myth of Jarilo, created by a Slovenian animation student Anja Rupar - https://www.youtube.com/watch?v=MJY7uOFCJEc. Special thanks to Rodobran, Horovat, Svyatogor, Rozo for information gathering, and to the wonderful M.A.M. for being a constant support!